I really like Portland. I really do. 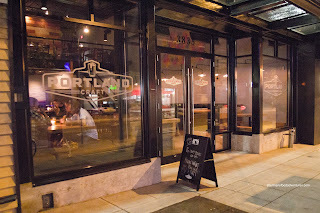 The eclecticness of the place including the cuisine and craft beers puts Vancouver to shame. Hey, Vancouver has a lot of places with beer too, but far too many serve only Tsing Tao and Asahi (if you know what I mean). 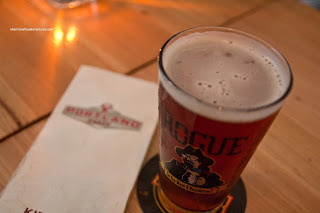 Hence, when I spotted a new joint out on Main Street called Portland Craft, it piqued my interest. By sheer coincidence, Gordo approached me one day and suggested we try it since it his brother-in-law has part ownership. And to make things more strange, another friend of mine asked me the same thing. So we actually knew both partners of the place. Naturally, this puts us in a slightly "biased" position, however, if you read this blog regularly, you'll know that I'm pretty upfront about my experiences regardless of the situation. So we paid for our meals with the exception of the desserts which were comped. I'm not going to comment on the service because it would obviously be good for our party. Formerly the Coppertank, the place still bears its old name at the top of the front facade. The room is open with a very high ceiling. We were seated upstairs where we got a great v iew of the entire restaurant. 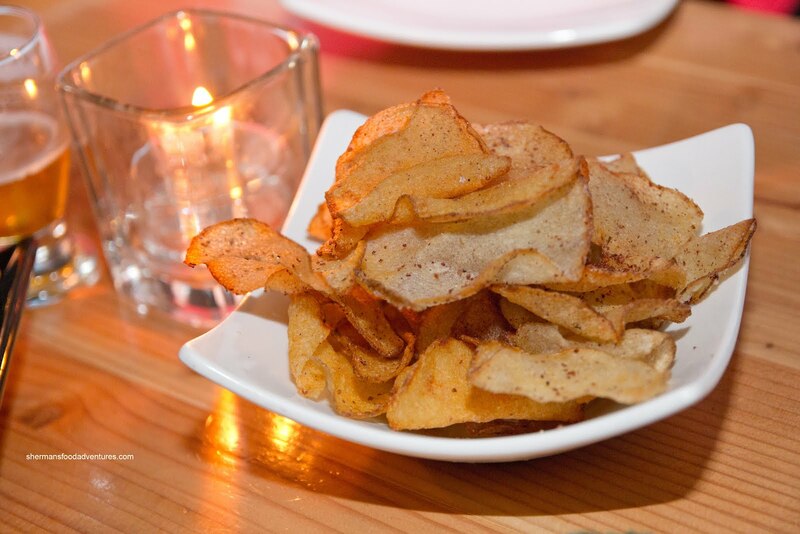 The atmosphere was naturally bar-like with people munching on snacks with their brews. And about those brews, they do have a wide selection that originates from... Portland of course. I got one of them being the Hopworks Rise Up Red. It was smooth with a bite at the end. For eats, Milhouse and I decided to share some items starting with the Pig and Pots. 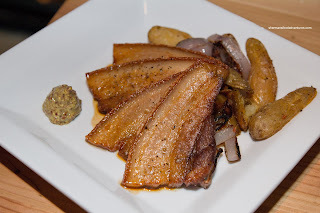 This was essentially braised pork belly, roasted shallots with crispy fingerling potatoes and a side of Dijon. Arriving on a plate with thick slices of fatty belly, our arteries began to ha rden before we even took a bite. By virtue of being so thick, the belly wasn't exactly that soft. In fact, the crackling was on the chewier side and hence, there was some effort involved in eating it. I liked the sweet glaze on it though. The potatoes were nice with a slight crispiness on the outside and starchy goodness on the inside. One item that I had to have was the Spot Prawn & Cheddar Grits because well, I love shrimp & grits! 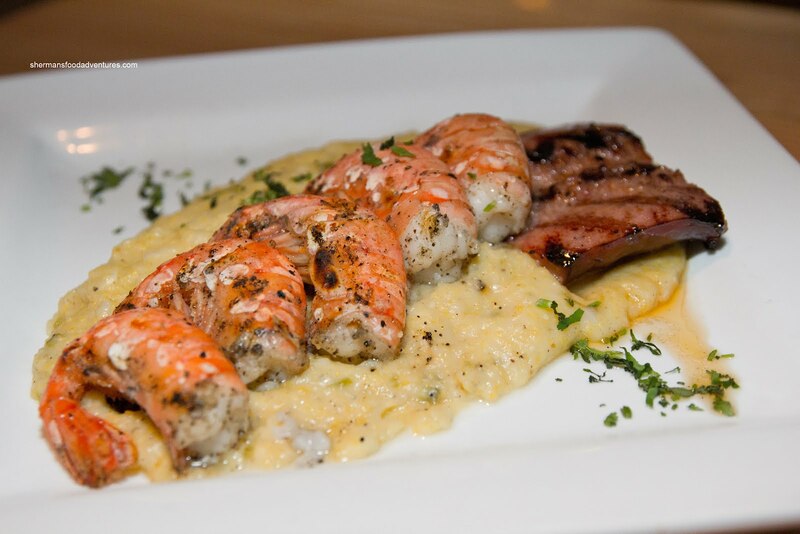 The good thing about this dish was the grits were crea my with some texture. It was well-seasoned with herbs, cheese and had a good consistency (not too thick nor watery). There was a slight kick from the jalapeno as well. The accompanying piece of sausage was good as well as being meaty and not overly fatty. It had a nice snap to it. The one thing that was not good were the spot prawns. These were obviously not fresh prawns which meant the meat was soft and mushy. It was too bad because this could've been a good dish. 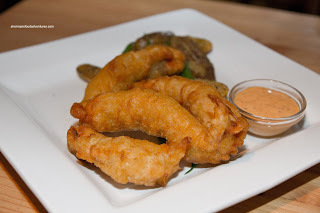 Lastly, we had the Hefeweizen Beer Battered Rainbow Trout, which arrived as a sort o f fish n' chips. The batter was crispy and light, albeit a bit greasy. The trout was nicely done being flaky and moist. I liked how the green beans were just barely cooked maintaining a crunch. The same fingerling potatoes as the pork belly completed the dish. I wasn't sold on the smoked paprika and roasted garlic mayo dip as a more traditional tartar sauce would've worked better. 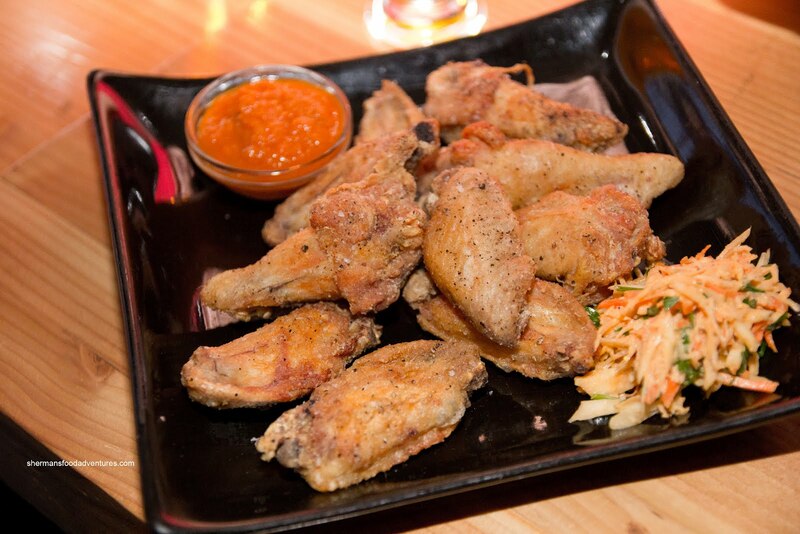 Gordo was feeling ambitious and had 4 items all to himself sta rting with the Salt n' Pepper Wings served with a side of celeriac and carrot slaw. These were good. The wings were fried crisp with the fat nicely rendered. There was a salty peppery thing going on with them in a mild fashion. The meat itself was not juicy per se, but it wasn't dry either. The one thing that really amped these up was the hot sauce on the side. That was killer. He also had the Sumac Spiced Potato Chips which were light and mostly crispy. The sumac added a certain tartness which kept the chips from being heavy. 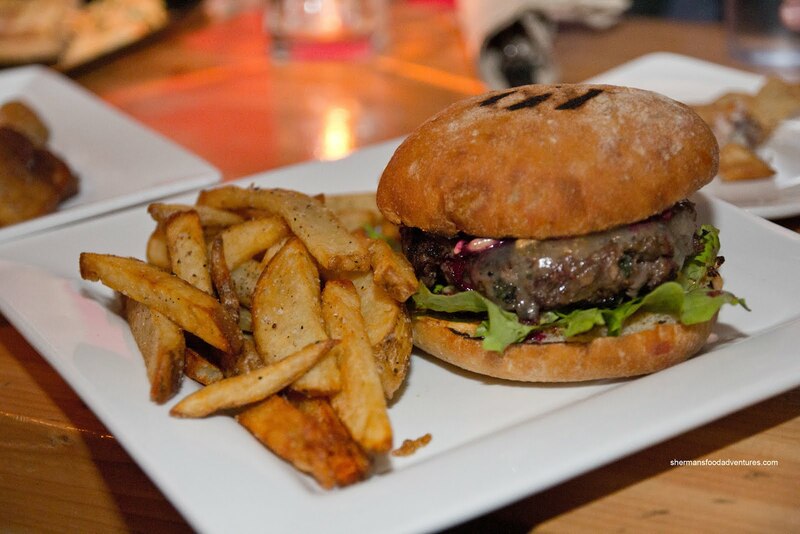 For his main, Gordo had the P ortland Craft Burger with a house made 6oz patty with basil, aged cheddar, pickled beets and a side of their house fries. I found the burger patty to be moist and a touch crumbly (in a good way though). It was slightly greasy, but then again, that's probably why it was moist. There was still considerable meat texture and I liked the addition of onions in the patty. The bun was a good balance between being soft and dense enough to hold up to the ingredients. The fries were the fresh-cut variety and could've been crispier. His 4th dish would be a dessert, which came later. 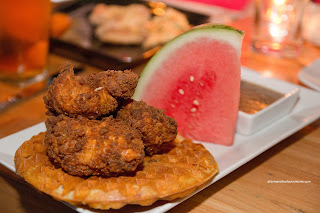 Emilicious and Sweet Tooth decided to share the Put a Bird on It which was really hop-fried buttermilk chicken on a Belgian waffle served with watermelon and gravy. The pieces of chicken were moist and fried perfectly. Crunchy outside and not dry inside, a good combination. As much as the waffle was okay, a thicker one (which would stand up to the chicken) would've been better. The thin waffle was already becoming soft as it hit the table. The side of gravy was mild and thick, yet personally, I would've liked to see a mapl e bacon glaze or something like that. 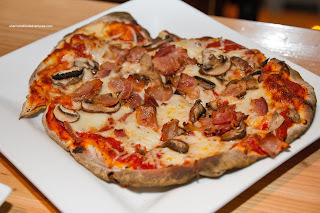 Gadget Girl had the Scratch Personal Pizza which was a bacon mushroom. The crust was thin, crispy, well-charred and held up well to the copious amount of toppings. Not a bad pizza for this type of establishment. 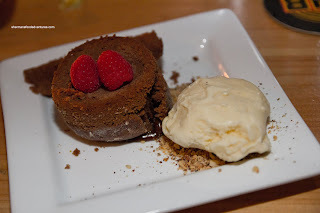 As mentioned, Gordo had 4 plates and his last was the Stout Chocolate Lava with hazelnut brittle and vanilla ice cream. Okay, there is no way of sugar-coating this... It was terrible. The cake was very dry and mealy. Furthermore, we didn't get much of a chocolate hit despite the visuals. On the positive side, the brittle and ice cream were good. For good measure, we tried the Sugar-Dusted Donut Bites (which usually has only 5, but they gave us 6 so we could all try it) with rose whipped cream filling. 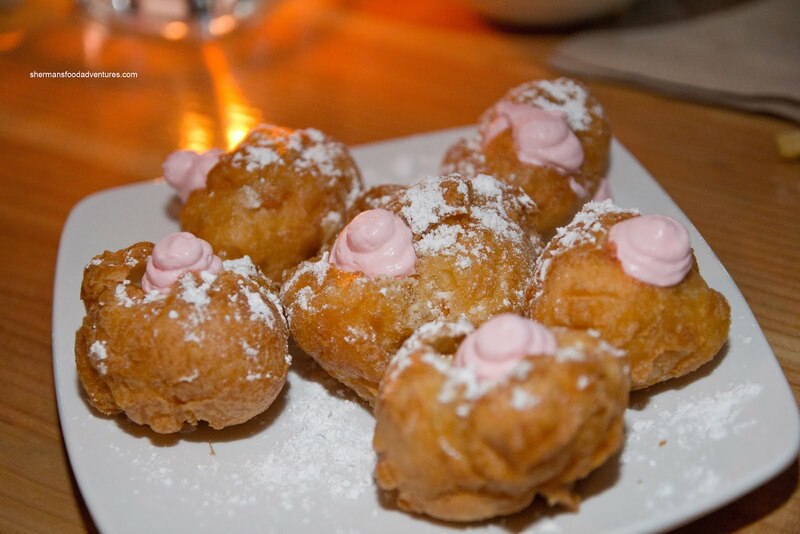 These were more like a cream puff than a donut and we liked it that way. They were light, airy and crisp. 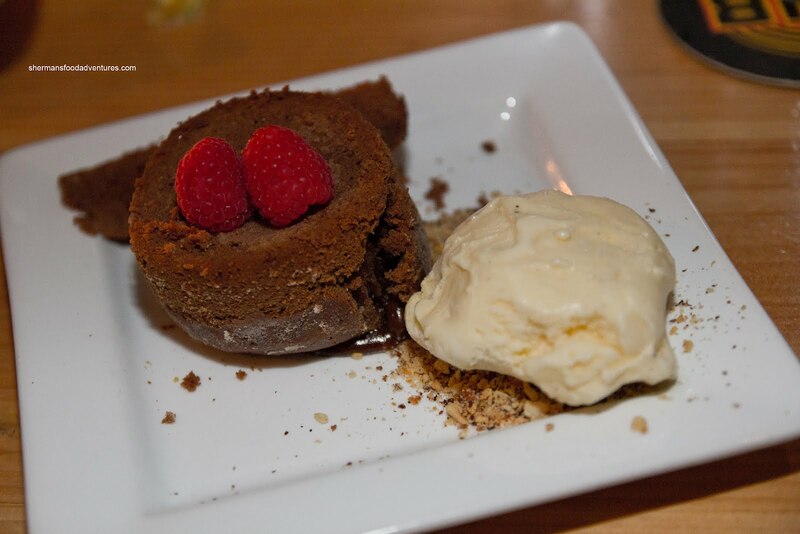 The cream was not heavy nor too sweet which kept the whole dessert very easy to eat. As you can probably ascertain, the meal was a bit up and down. There were some high points as well as some low ones. We liked how they are trying to be a bit different with their menu and approach. However, some refinement is needed, especially with specific dishes. 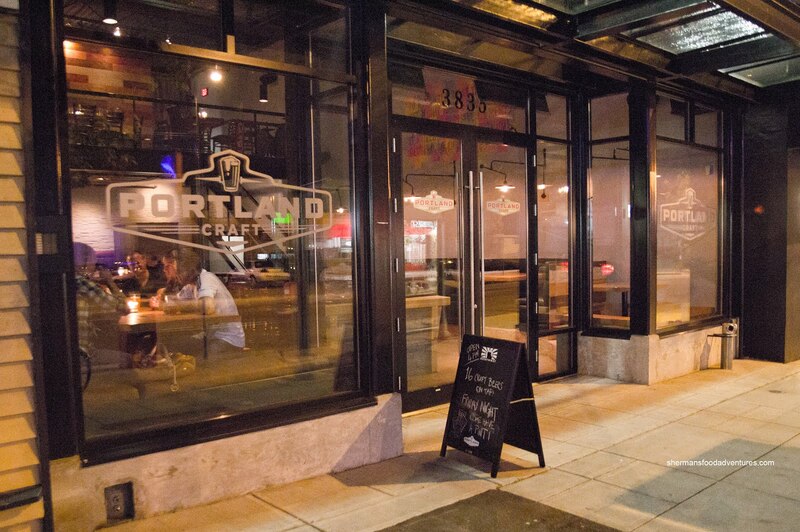 One thing is for sure though, the place is great for grabbing a brew, hang out with friends possibly having some eats with it. It reminds me a little like Bitter where the drinks are at the forefront, while the food plays second fiddle.